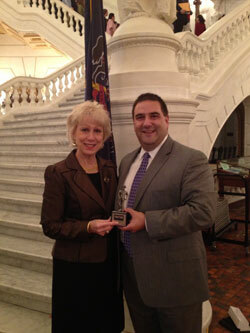 Rep. Karen Boback (R-Luzerne/Columbia/Wyoming) accepted her “Guardian of Small Business Award” from Pennsylvania National Federation of Independent Business State Director Kevin Shivers. HARRISBURG - Realizing that small businesses are the backbone of our economy, state Rep. Karen Boback (R-Luzerne/Columbia/Wyoming) was recently awarded a “Guardian of Small Business” by the Pennsylvania Leadership Council of the National Federation of Independent Business (NFIB) in recognition of her business-friendly voting record for the 2011-12 legislative session. “It’s an honor to be recognized by the NFIB and I will continue to support legislation to promote job growth in the 117th Legislative District and all communities across Pennsylvania, while also making our state a more business-friendly environment where small businesses have the opportunity to grow, prosper and create jobs,” said Boback. The “Guardians of Small Business” designations are awarded to legislators who consistently vote favorably on key small-business issues. The votes tracked this session are among the highest priorities of NFIB’s small business agenda – a legal reform and regulatory relief, tax and fiscal policy, and unemployment and workers compensation reforms. For more legislative information, visit Boback’s website at www.RepBoback.com or follow her legislative Facebook page at www.Facebook.com/RepBoback.